Critics of the 2016 Philippine War on Drugs claim that there’s reckless bloodbath going on as the government allegedly employs (or at least, encourages) vigilantes to murder drug suspects, including innocent civilians. But is there really a reckless bloodbath as a result of the new administration’s policies, or is the bloodbath something that the administration inherited from the Aquino Presidency? Alam niyo kasi, nagkahalo-halo na ang paratang, nagkanda-bandwagon-bandwagon, kaya ang hirap matukoy kung alin ang alin. Tara’t linawin natin. This claim obviously requires evidence to gain credence, and the Inquirer is here to save the day. Updated twice a week since 07 July 2016, The Philippine Daily Inquirer describes its infamous “Kill List” as “an attempt to document the names and other particulars of the casualties in the Duterte administration’s war on crimes”. This “Kill List” is often used to justify the claim that there is a bloodbath in the Philippines today [IBTimes]. This Kill List is the primary basis of criticisms of human rights and anti-administration keyboard warriors alike. As of 12 August 2016, the Inquirer claims that 601 suspects have been killed as result of Duterte’s crime-fighting policy. There’s a fundamental problem in Inquirer's methodology. Unlike ThinkingPinoy’s posts, none of the of the 601 entries link to a specific news article, making verification difficult. The Kill List also contains extremely vague entries such as “2:00 a.m. | Unidentified suspect #203, alleged robbers | Manila, Metro Manila | Killed in police shootout”. How can anyone verify that? Do Inquirer’s web developers find it too difficult to use hyperlinks? In short, for the common Filipino, the truthfulness of this list basically rests upon the Inquirer’s reputation, something that’s very hard to rely on, especially since Inquirer has conflicts of interest. In particular, Inquirer CEO Sandy Prieto-Romualdez [Inq] is married to Benjamin Philip G. Romualdez, the president of the Chamber of Mines [CoM]. We all know that Duterte is excruciatingly tough on mining [Reuters], so I find it difficult to take Inquirer’s word for it when the fact of the matter is that Duterte’s downfall will benefit their CEO’s interests. In short, gusto Inquirer na maniwala tayo sa Kill List dahil “BASTA!” Eh pano kung gusto ng Inq CEO na bumagsak si Duterte para happy-happy sila sa mining? Pero sige, patulan natin ang Kill List na ito at tingnan natin kung may point ba o wala. But what exactly does “surge” mean anyway? Dictionary.com defines “surge” as “a sudden, strong increase”. That is, the premise that there’s a surge requires proof of a “a sudden, strong increase”. 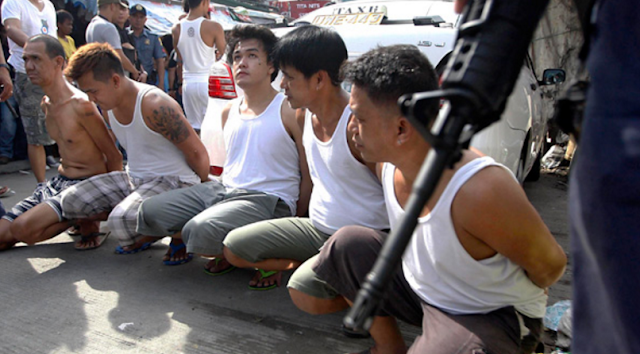 A comparison in the total number of killings of suspected criminals is markedly higher than a previous period. Now, let’s examine if these two assumptions correspond to reality. The first assumption – the PNP has been doing a good job before Duterte – is essential for a surge to occur, as it would imply that Duterte didn’t inherit an accumulation of crime arising from uncompleted Aquino-era police work. After all, if the Aquino administration was “Noynoying” on crime, there will be a surge in such deaths if Duterte starts working, but that surge would be understandable, and the rage wouldn’t be as much as it is now. The problem, however, is that first assumption is questionable, as the PNP itself admitted in 2014 that it was doctoring crime statistics to meet DILG Secretary Mar Roxas’s extremely high standards. For example, when asked in 2014 why he fired NCR police chiefs, Roxas said, “All I know is that the present statistics is not acceptable… that’s why we decided that maybe it’s time for new leadership.” Roxas added [TP: Lambat-Sibat]. In an August 2015 Senate hearing , PNP Criminal Investigation and Detection Group (CIDG) Chief Benjamin Magalong admitted that Oplan Lambat-Sibat exerts severe pressure on each local police station to lower their crime rates [Interaksyon]. With problematic PNP stats, how can we discount the possibility that the Aquino administration did so much Noynoying that crime has reached unprecedented levels? Let’s set this one aside and examine the other assumption. Is 601 deaths from 30 June to 12 August markedly higher than the total from 30 June to 12 August of last year? The Inquirer didn’t show that. Is 601 deaths from 30 June to 12 August markedly higher than the total from 30 May to June 12? The Inquirer didn’t show that either. Is 601 deaths from 30 June to 12 August markedly higher than the total from any month within the past 6 years? The Inquirer didn’t show that either. The burden of proof lies on the accuser, so why did Inquirer all-too-conveniently fail to address at least one of the three questions listed above? If the Inquirer said “there’s a large number of suspected criminals killed”, I would have yielded. But how exactly can surge be called a surge when there is no reference point in the first place? Yes, the Inquirer’s second assumption also fails. The faulty logic on Inquirer’s part should be making the late Inquirer chief Letty Magsanoc turn over in her grave. Given these two problematic premises, it’s pretty clear that the Inquirer’s statement, “The surge in the killing of suspected criminals since June 30, 2016, has been marked and unmistakable,“ sits on shaky logical ground. Hay nako.Pero sige, patulan pa rin natin. But now that we’re already at it, why don’t we scrutinize the Kill List a little further? Aside from the ambiguity of the term “drug-related killing”, finding the exact number of drug-related killings in previous years would be impossible because that would require accurate reporting. As explained the previous section, those numbers are unreliable because PNP doctored stats during Oplan Lambat-Sibat. Pano natin ikukumpara stats ng Lambat Sibat e dinugas nga yung mga number na yon? Roxas was made DILG secretary in August 2012 [GMA], but his Oplan Lambat was launched in 2014 [PNP]. So let’s avoid PNP stats for 2014 and 2015, and use crime stats from 2010 to 2013. More specifically, let us compare the number of those “killed by unknown gunmen” as reported by the Inquirer versus the number of those killed by “riding-in-tandem” vigilantes during the Aquino administration. X should be markedly greater than Y to show a surge. Clearly, Z is a subset of Y, as there may be unknown gunmen who aren’t riding in tandem, so that Z is less than Y. Thus, if we can show that X is less than Z, then X is less than Y because of the transitive property of inequalities. If X is less than Z, then there is no surge. That would actually show a drop instead. That is, if we can show that there are fewer killed by unknown gunmen per Kill List than those killed by riding-in-tandem vigilantes, then there is no surge in vigilante killings. Tara't ituloy natin, konti na lang. ThinkingPinoy counted the number of instances of “killed by unknown gunmen/hitmen” in Inquirer’s kill list from 30 June 2016 to 12 August 2016. TP found that there were 144 such incidents over this 44-day period, this translates to about 3.27 vigilante killings per day (this our X). There are 3.27 vigilante killings per day under the Duterte Administration so far. How does this rate compare with previous years? In 2013, 3,000 crimes related to riding in tandem motorcycle riders have been recorded in Metro Manila alone [Senate]. UPDATE: Some people tried to clarify if these "victims" actually died. Journalists were among those murdered by hired gunmen riding in motorbikes. The latest victim was Christopher Guarin, 42, a veteran radio block-timer commentator and editor-publisher of Tatak News Nationwide, a community newspaper based in General Santos City, who was shot dead by motorcycle-riding-in tandem gunmen in the presence of his horrified wife early this month. In 2011, the PNP recorded 1,700 crime incidents involving riding-in-tandem suspects with 2,089 victims. This is higher than the 1,565 incidents in 2010 with 1,819 victims. So yes, they were murdered. The 2010 statistic shows 4.98 riding-in-tandem murders daily. The 2011 statistic shows 5.72 riding-in-tandem murders daily. The 2013 statistic shows 8.21 riding-in-tandem murders daily in Metro Manila alone. Duterte-era vigilante killings is 3.27 per day. This is MARKEDLY LOWER than 4.98, 5.72, and 8.21, which are the absolute minimum rate of vigilante killings during the past administration. Let me explain this more simply. There were 144 vigilante killings in Duterte’s first 44 days as president, per Inquirer Kill List. Using the 2010 statistic, there would be at least 219 vigilante deaths over the same 44-day period. 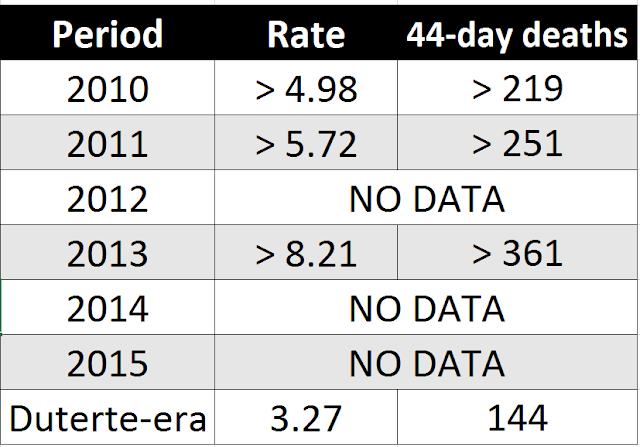 Using the 2011 statistic, there would be at least 251 vigilante deaths over the same 44-day period. Using the 2013 statistic, there would be at least 361 vigilante deaths over the same 44-day period. 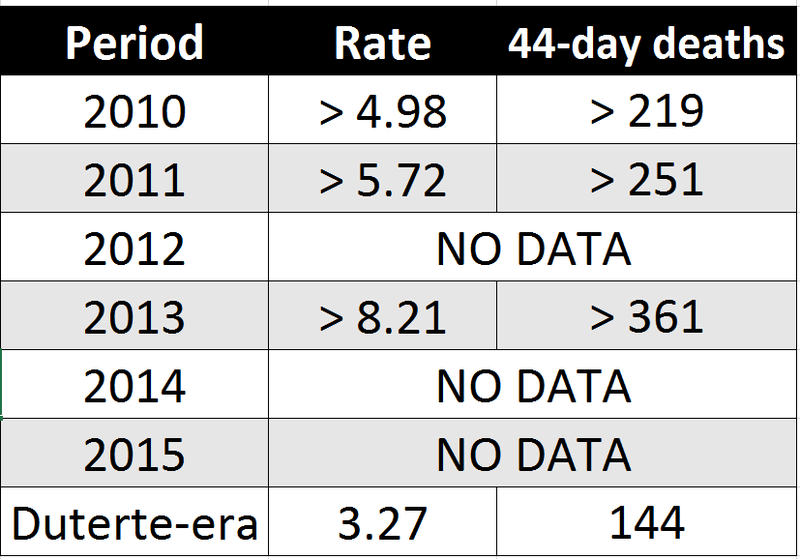 Yes, empirical data indicate that there are actually FEWER vigilante killings after Duterte took office, when compared to the same period in previous years. So nasaan ang "unmistakable surge" na sinasabi ng Inquirer? Tangina, wala pala. At this point, I think those who speak against vigilante killings should not only fight for the right to life. They should also fight for the right to learn arithmetic.